Elvis Exotica is a concept only imaginable in extreme retrospect, and I’m sure that enterprising souls at RCA (or elsewhere) will shove something resembling a compilation together in due course. It’s a pity that no one thought to link Elvis up with Martin Denny or Esquivel at the time, rather than rely on the stolidly stalwart likes of Tepper and Bennett to come up with pale photocopies. Still, throughout the Blue Hawaii soundtrack there are tempting hints of what might have been; Presley’s worried surfer of a voice floating carefully over shallow but colourful conduits of steel guitar, marimba, maracas and sombre Jordanaire harmonies, somewhat baffled as to how he has washed up on this island. In the film he is Chadwick Gates (as one is), a newly-demobbed GI (spotted the link yet?) who opts for the life of the beach bum over that of a trainee fruit company executive, much to the chagrin of his parents – one of whom, Angela Lansbury, was less than ten years Presley’s senior – and so Blue Hawaii set the tone for eight years or so of cinematic beach bumming, an era wherein Presley worked hard at seeming not to work at all, and probably wished that he wasn’t. My father – who knew his cinema, and knew his opinions even more – thought Blue Hawaii absolutely the worst movie ever made but I’m not sure whether he saw the subsequent Paradise, Hawaiian Style, next to which Blue Hawaii plays like The Magnificent Ambersons. Presley’s sixties films by and large strolled carelessly (in all the wrong ways) through a dentist’s waiting office of glossy magazine covers masquerading as plots and the Blue Hawaii songs more or less act as the blandest of travelogues. Hawaii had only recently (August 1959) been admitted to the Union and was reasonably hip, but already the tourist industry was manfully assembling its own clichés and most, if not all, can be found here; “Aloha-Oe” is the same tune to which Spike Jones’ narrator previously announced their boat to be sinking slowly in the West, and though not straightforwardly structured – an out-of-tempo cod-operatic Hawaiian tenor introduction, oddly punctuated by Boots Randolph’s hissing tenor sax, and a final wriggle of an acoustic guitar chord which seems to cling on forever in the hope of something better – tells us instantly that tour guide is not Elvis’ calling in this life. The introduction to “Blue Hawaii” itself is moderately startling, almost out of Les Baxter with its subaquatic booms of voices and eddying strings. Yet the song is an old Bing Crosby standard – possibly payback for Bing standing up for Elvis when first he appeared – and Elvis seems, here and elsewhere, to be marooned in a thirties neverland with controlled crooning and overbearing Jordanaires backing vocals (on “Blue Hawaii” they are back to their old tricks – “THE NIGHT IS YOUNG” and “AND SO ARE WE SO ARE WE” being the most intrusive). “Moonlight Swim”’s mild suggestiveness (“I’ll keep you warm/So very warm from your head to your feet”) is flattened entirely by the Anita Bryant disciples who come in and scrape their vocal nails down Elvis’ blackboard, such that the final effect is one of Rudy Vallee trapped in a greying elevator. 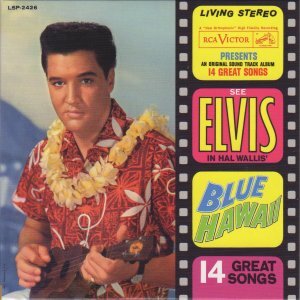 “Hawaiian Wedding Song,” which went on to become one of Presley’s most popular stage songs of the seventies, dates from 1926 and sounds it; the arrangement is so suffocatingly “epic” (“Soon bells will be ringing” answered by the Jordanaires’ “ring, ring, ring, ring,” the latter crying out for a “w” prefix and a “their necks” suffix) that Presley sounds, as Lena suggested, as though he wants to marry the state of Hawaii rather than His Girl. His final cry of “blue skies” is a desperate grasp for oxygen in the sea that is placidly drowning him. He does a little better with “Ku-U-I-Po” despite, or because of, its strangely phrased sentiments (“I love you less today than I will tomorrow”) but “ Island Of Love ” is strictly tourist board daytime ad country. Many of the songs of Blue Hawaii seem to have been sourced by sticking a pin in different issues of Billboard. Generally Presley sounds more engaged with the uptempo rockers – generally substandard though they are – and while Randolph’s excitable tenor and Hank Garland’s brake screech guitar (in an unusually long intro) make “Almost Always True” initially exciting, not to mention Presley’s expert ducking and diving into two-timing and mock innocence (the steady, minimalist drip drip staccato sequences which he swiftly terminates with an anguished/contented downward growl of “Ohhhhhh!!! !”), it took Lena to point out that melodically this was a recasting of children’s favourite “Alouette.” The fact that Elvis should spring to life singing a modified song about plucking the feathers of a dead bird should prove ample ammunition for future allegorists. “No More” also sounds suspiciously familiar in its Dean Martin-goes-Latin-for-a-day amble until you realise that it’s a reshaped “Amor” (subsequently a hit for Julio Iglesias in its original form). Elsewhere there is congestion and confusion. “Hawaiian Sunset” is described as “peeping from the sun” (despite its melodic and lyrical portents of Richard Hawley’s “Darling Wait For Me”) and goes downhill from there. “Slicin’ Sand” is a feeble rocker (“Got a lot of ocean if it gets too hot”) with the Jordanaires loudly booming the song out of existence and Garland contributing a bored-sounding guitar solo. “Beach Boy Blues” is a case of pouring too many mixes into too small a pot; the Jordanaires’ bulbous bellowing battles with George Field’s harmonica, the rhythm section (and Presley himself) uncertain whether to rock or to play the blues ( Garland ’s solo does its best to negotiate midway). When singing “Only 30 days and 90 years to go” Presley sounds wearier and more prematurely exhausted than ever he had done, and the writhing continues until DJ Fontana mercifully puts the song out of its misery by hammering it to pieces. Worst of all is perhaps “Ito Eats,” a calamitous misreading of Harry Belafonte – and how and when did Hawaii suddenly become Jamaica ? Here, Presley sounds positively embarrassed, and with lines such as “Ito eat like teeth are out of style” and “He even eat the shell from the coconut” (are we suddenly listening to the George Mitchell Minstrels again? ), nobody could blame him, apart from the terminal crime of going along with it and allowing it to happen. “Eat-o little faster!” he pleads (“One pineapple straight to the head!” yelled Lena ). It also bears one of the most bizarre endings to any Elvis song, a solitary, agonised, atonal, groaning, croaking Jordanaire (are we suddenly listening to Daniel Johnston?). And yet and yet and yet…as with every manufactured clipboard of tourist attractions, magic sometimes occurs. The “Can’t Help Falling In Love”/”Rock-A-Hula Baby” double header single was huge and undeniably instrumental in keeping the soundtrack at number one for much of the first half of 1962 (though the single mixes downplay the more obvious Hawaiian elements) and even more surprisingly works. For once, on “Rock-A-Hula Baby,” corn though it may be (well, it’s sweetcorn), Presley actually sounds as though he’s enjoying himself, bouncing off the pinball streaks of steel guitar (Bernie Lewis, the album’s unsung hero). Even the Jordanaires are having fun, unchained with their near maniacal screams of “RockMAN rockMAN rockMAN!” (are we suddenly listening to the KLF?) behind Garland ’s unhinged solo, and wailing orgasmically over Fontana ’s closing drum demolition derby. And the moment of true magic, of real blue in real air, dates back to 1780. “Can’t Help Falling In Love” was modelled on the song “Plaisir d’Amour” and with his reading Elvis stops the show altogether and starts other, newer things. There is no overarranging here – both marimba and steel guitar are positioned very subtly in the middleground – simply an ocean of celeste doo wop, weightless yet profound, Presley (relatively, emotionally) naked, offering his hand, his whole life too, kissing away the shadows of Rodgers and Hammerstein; as with its contemporary “Moon River” and its vague, slowly-to-the-sea metaphorical antecedent “Unchained Melody” its magic seems to shine a star upon the pop of its age. It utterly transcends the forced banality of its surroundings and reminds us of other important consequences which nobody could have foreseen from Blue Hawaii; not simply how deeply the record, as imagined experience, as sonographic environment, would have been absorbed and remembered by Brian Wilson (“Beach Boy Blues”) when he came to do SMiLE – and note how, in the final, reassembled SMiLE, his Worried Man’s adventures end – perhaps in the afterlife - in blue Hawaii, but also…well, throughout the album, quietly playing ukulele (and a little pedal steel guitar), barely noticeable but indispensable, appears Alvino Rey, grandfather of Arcade Fire’s Win and William Butler. If only Elvis had lived to sing “Wake Up” in an age when nobody would have been twisting his impossibly exotic arm.